1) Isn’t the Exodus story a myth? There is an ancient Egyptian papyrus document called the Ipuwer Papyrus, which seems to recount in eye-witness fashion the plague of blood, the plague of cattle, the plague of strange fire, the plague on the firstborn, as well as the strange darkness – events previously known only from the Bible, in the book of Exodus. The Ipuwer Papyrus, often referred to as the Papyrus Ipuwer, is believed to have been written between 1,600 B.C. and 1,850 B.C. The oldest copy in existence was purchased from a collector in 1828 and translated into English in 1909. Currently the Ipuwer Papyrus resides in the Dutch National Museum of Antiquities in Leiden, Netherlands. This small piece of papyrus has sparked a great deal of debate and scholars remain divided over its true meaning and purpose. The primary interest for our purposes are the striking similarities to the plagues recorded in the book of Exodus. First let’s take a look at the similarities between the Ipuwer Papyrus and the Book of Exodus. There is no denying the two are shockingly similar and it should come as no surprise that many use the papyrus in their arguments for the story of the plagues being historical fact.  The Iupwer also speaks of a pestilence throughout the land and the collapse of order that servants are leaving their servitude and acting Rebelliously. Some translations tell how the king has been taken away by poor men. All of these examples show how many people, some scholars included, have claimed the Ipuwer Papyrus to be speaking of the plagues as recorded in the Bible. When read in this manner it is in fact hard to deny the similarities and to come to any other conclusion. However, when read in its entirety, the Ipuwer Papyrus takes on an entirely new meaning to many scholars. Interestingly, some scholars believe the papyrus recorded the events immediately following the plagues when the land of Egypt was invaded and conquered. Given the condition of the country, and its armies, after the plagues it should not come as any surprise that Egypt’s advisories would take advantage of the opportunity and invade. In one line the Ipuwer records, ” The stranger people from outside are come into Egypt.” Only one of the eight examples listed above seem to relate to an invasion. Example number eight could easily be seen as the result of an invasion by a conquering army. It would be difficult to believe that two independently written documents, recording similar events all of which take place in Egypt, can be so similar and are in no way related to one another. To what degree they are connected is difficult if not impossible to determine. While any connection to the book of Exodus is hotly debated and refuted by many scholars, the Ipuwer Papyrus remains an interesting element worthy of study and further evaluation. We also can rely on the bible account as well. The five books of Moses (including Exodus) abound with Egyptian words, roots and phrases, as would be expected of a writer who had come out of Egypt. “The contents of our pentateuch [the five book of Moses] are, in general, very much older than the date at which they were finally edited; new discoveries continue to confirm the historical accuracy or the literary antiquity of detail after detail in it….It is, accordingly, sheer hypercriticism to deny substantially Mosaic character of the pentateuchal tradition.” CH Dodd, More New Testament Studies, p.224. Manchester University Press, 1968. 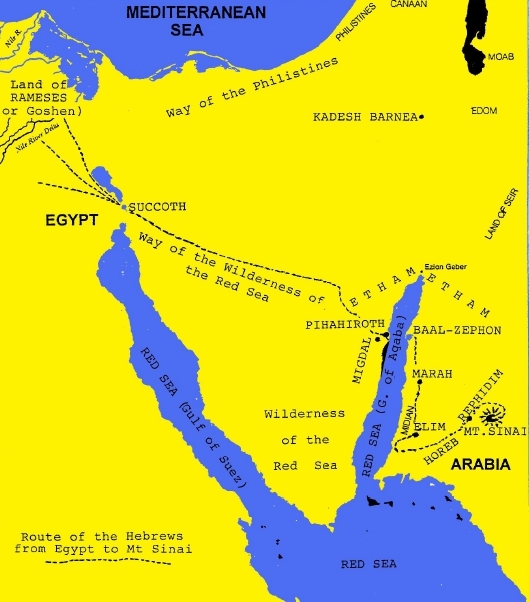 2) Where were the various stops along the Exodus route from Egypt to the Red Sea? • Where was the crossing spot? Firstly, the Israelites travelled from Rameses to Succoth (Exodus 12:37). “And Joseph placed his father and his brethern, and gave them a possession in the land of Egypt, in the best of the land , in the land of Rameses, as Pharaoh commanded” Genesis 47:11. “And Israel dwelt in the land of Egypt, in the country of Goshen; and they had possessions therein, and grew, and multiplied exceedingly” Genesis 47:27. Moses gathered the Israelties (Hebrews) at Succoth (Exodus 12:37). Succoth had to be a place large enough for this tremendous amount of people and flocks to assemble. “Succoth” is a Hebrew transliteration of the Egyptian “Tjeku” mentioned in Egyptian documents as a border station. It was also known as “Tharu”. In ancient Egypt there was a line of guarded fortifications along the canal which connected the Gulf of Suez with the Mediterranean sea. This canal is known to have existed anciently, by satellite photos and infra-red photos, which still show its path. At the border – the point where one would leave Egypt proper and go into the Sinai desert, there was a fortress and a bridge. This was located near the Delta where the Israelites were living. “Tharu” was where the Egyptian army assembled in preparation for their military expeditions to the north. 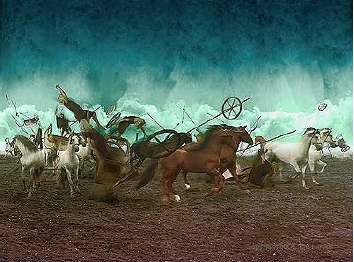 Armies consisted of a great deal of men, horses and chariots; and they required a large area to assemble properly. Moses well knew Tharu, called “Succoth” in the Biblical account – and it was here that he orgainzed the people for their journey. They had left Egypt proper once they crossed this line of fortification, just as the Lord had promised. Yes, Moses was thoroughly trained in all aspects of military leadership and would have known well how to assemble large numbers of people for travel. The fact that Moses was indeed a general in the Egyptian army seems to have been a well-known fact. Josephus writes about this in his Antiquities of the Jews, Bk.2 and ch.X. As a military man, once again, Moses knew “Tharu”, and it was here that he orgainzed his largest “army” ever travel. And from this assembly point, they travelled to Etham. 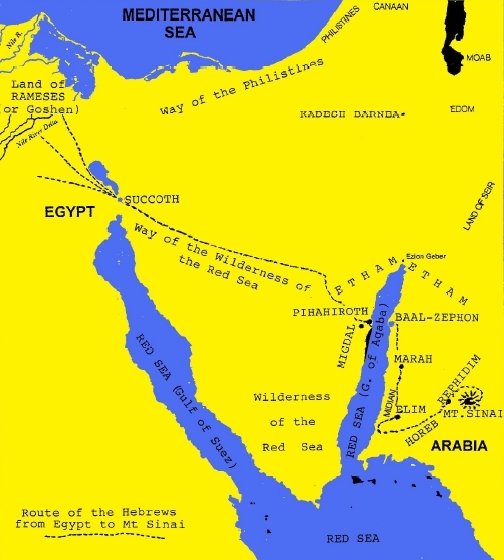 – Route B – “the way of the wilderness of the Red Sea” – the southern route (v.18). They took the southern (and longer) route. Josephus, the Jewish historian, concurs that the Hebrews headed southward from Egypt. “But God led the people about, through the way of the wilderness of the Red Sea” Exodus 13:18. 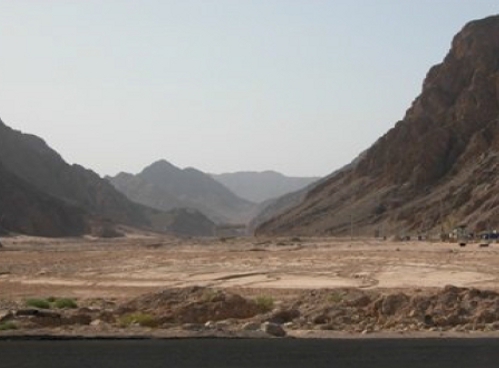 It was the Wilderness of the Red Sea – the mountainous land of the mid and southern Sinai Peninsula. This was along a route that was commonly taken in those days by both caravans and the army, and it was called “the southern route”. This route was taken because it was safer than travelling along the coastal “northern” route, where the Philistines were. Etham was not a singular location, but a region. How do we know this? Because they were in Etham BEFORE they crossed the Red Sea (Exodus 13:20). And they were still in an area called Etham AFTER they crossed the sea (Numbers 33:8). Etham was, therefore, a designation of the land that lay around the mid-northern edge of the Gulf of Aqaba. “Speak unto the children of Israel, that they turn and encamp before Pihahiroth, between Migdol and the sea, over against Baalzephon; before it ye shall encamp by the sea. For Pharaoh will say of the children of Israel, they are entangled in the land, the wilderness hath shut them in” Exodus 14:2,3. To be “entangled in the land”, they would have to be travelling through an area with mountains all round, hemming them in. This is BEFORE crossing the sea. So from Etham they changed their direction of travel (“that they turn”) and went south. They found themselves entering the mountains, along a dry river bed system that must have appeared like an endless maze to them. 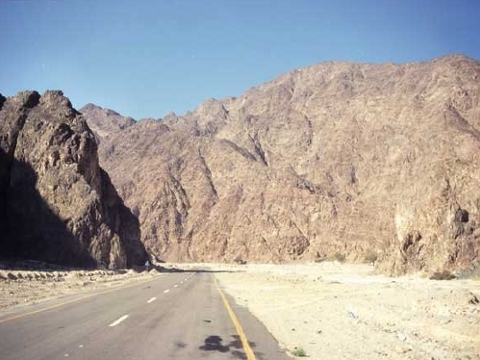 The 27 kilometer (17 mile) Wadi Watir is a natural highway from Egypt. The multitude comprised 603,000 men, as well as women and children – perhaps as many as two million people. As the great multitude WEAVED their way through this awesome and wild canyon, it would appear that they were entangled. Hemmed in to the left and right, they could travel in only one direction. 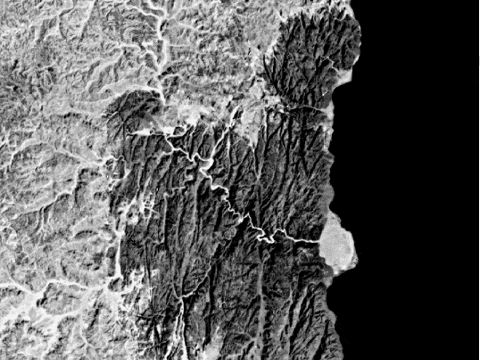 The only path through that wadi leads to an enormous beach – so big that it can be seen on satellite maps. 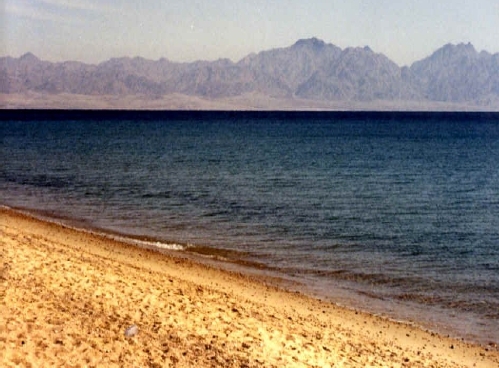 The beach head is named today “Nuweiba”. The root of this name suggests that some misfortunate incident happened here (Haas Wehr Arabic-English dictionary). It is speculative to say whether or not it refers to the drowning of the Egyptian army in the Red Sea. 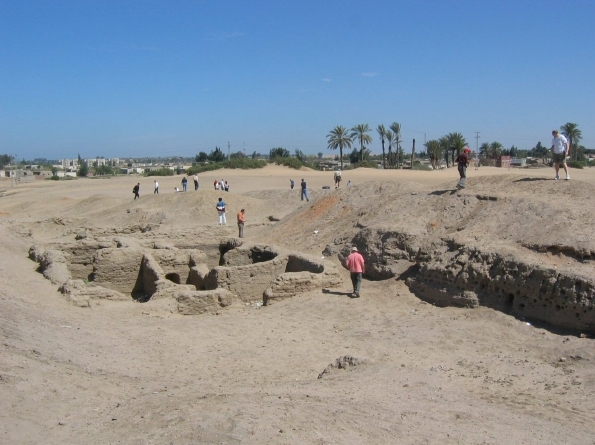 On the north end of the beach area are the remains of an ancient Egyptian fortress – another evidence that Egyptian territory extended all the way through the Sinai Peninsula. We believe this was Pihahiroth. Pihahiroth means; “Mouth of Gorges” (Strong’s concordance). As was the typical custom of the people of that time, they named it after an attribute of the geology of that place. 7) Where was the crossing spot? The Wadi Watir leads to a wide expanse of beach on the Gulf of Aqaba arm of the Red Sea, which could easily have held the multitude, their flocks and also Pharaohs pursuing army – separating the two groups by several kilometres. This beach at Nuwebia is so large (7km by 3km); it can easily be seen on satellite maps. It is the only place that matches all the requirements of our checklist. As they were now encamped between Migdol and the sea, Migdol could be either the mountains to the west, which make a perfect barrier, enclosing them on the beach, or it may have been a watch-tower atop one of those mountains. (The name “Migdol” means “tower” or “fortress”). The Egyptians had watch-posts all through the Sinai Peninsula. It is documented that they flashed messages from tower-to-tower by day and night, using reflected light. Perhaps this is how Pharaoh knew exactly where the escaped slaves had gone. 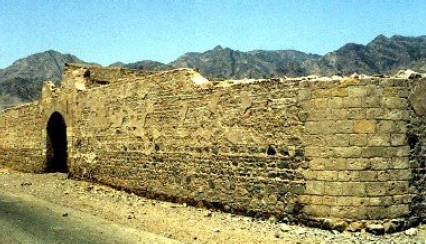 On the opposite shore, in Saudi Arabia, precisely across from where they camped by the sea, is another ancient structure. All alone on the beach, it may have been a Midianite fortress, dedicated to Baal; we believe this could be Baalzephon. The phrase “over against” seems to mean “opposite from” in respect to being across a body of water. (As, for example, in Deuteronomy 32:49 “……in the land of Moab, that is over against Jericho” – meaning across the Jordan River from Jericho). 10) Isn’t the Gulf of Aqaba too far from Egypt? Wouldn’t it have taken too long to get there? The record says that they travelled both day and night (Exodus 13:21). This means they did not stop and camp much at all. Knowing that the Egyptians would spend time in mourning and burying their dead as a result of the tenth plague, they knew the Egyptians would be bent on revenge. THEY WERE IN A HURRY! “Ye have seen what I did unto the Egyptians and how I bare you ON EAGLES WINGS..” Exodus 19:4. Again, we are told in Scripture, that this Israelite trip was accomplished by a miracle – just as was their 40 year wilderness wandering. When the Bible mentions an eagle it usually refers to ‘SWIFTNESS’. For example in Daniel 7:4 a Leopard is depicted with EAGLES WINGS. This denotes Alexander the Great’s SPEED of conquest. In Exodus 19:4, the implication is that their journey was a MIRACLE – that the Israelites were supernaturally strengthened to accomplish this journey swiftly. Because the distance was NOT SHORT, BUT LONG. If the distance was only to the Gulf of Suez you would not need a miracle to get there quickly. Thus, the Biblical account does not suggest a short, but rather a long distance – which required travelling by both day and night. The question arises, is it possible to travel to the Gulf of Aqaba on foot in three days and nights? The distance from the Suez Canal to Nuweiba is 336km (210 miles). 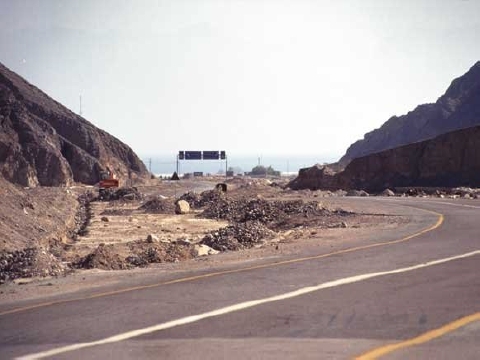 In 1967, Israel’s Moshe Dayan marched his troops ON FOOT over the same route, in reverse, that the Hebrews took – between Succoth and the Gulf of Aqaba. Marching only by day they did it in 6 days. And the modern Israeli marchers camped at night. “And the LORD went before them by day in a pillar of cloud, to lead them the way; and by night in a pillar of fire, to give them light; to go by day and night” Exodus 13:21. With divine assistance, this huge mass of people travelled in an orderly manner both day and night, with great speed: “Ye have seen what I did to the Egyptians, and how I bore you on eagles wings”. Even if they accomplished the trip in 3 days and 3 nights (equivalent to the 6 days of marching on foot performed by the Israeli troops over the same distance), that would be at an average speed of no more than 4.67km (2.9 miles) per hour. 11) Why do Exodus Route Maps put some of the cities differently, where you claim them to be? 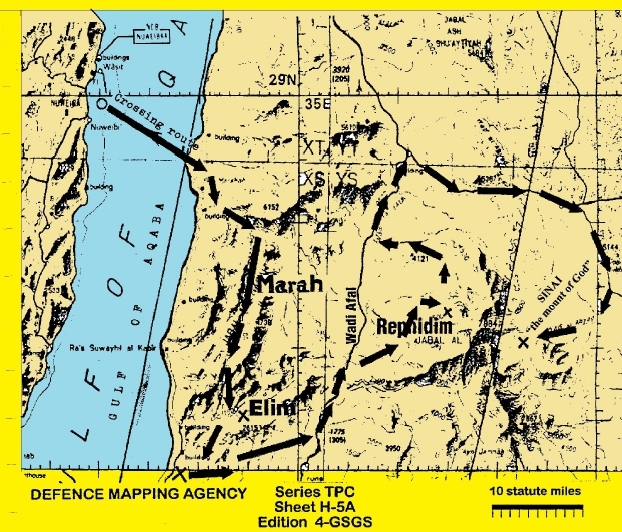 Since scholars have placed Mt.Sinai in Egyptian territory, they are compelled as a result to locate all of the preliminary stops likewise on the traditional Sinai Peninsula. This impediment of miss-alignment with the Biblical account that the conventionally trained scholars have inherited, has led them into trying all sorts of clumsy techniques to make their theory fit. Their maps of the route often wildly disagree – since they are based only on speculation. Some of the map-makers are honest enough to insert question marks (?) after each name. 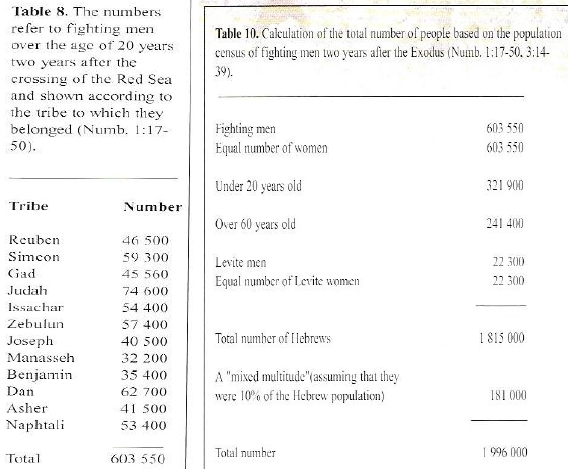 12) Why do the vast majority of Scholars reject this Red Sea discovery? Micheal Lemonick (U.S. Time Magazine) would tell us that “most scholars suspect that Abraham, Isaac and Jacob….never existed; many doubt the tales of slavery in Egypt and the Exodus” Time, December 18th, 1995. 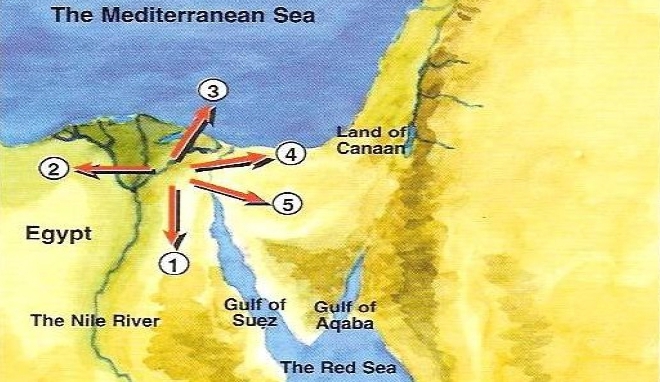 13) Didn’t the crossing occur at the “sea of reeds or bitter lakes” at the eastern border of Egypt? 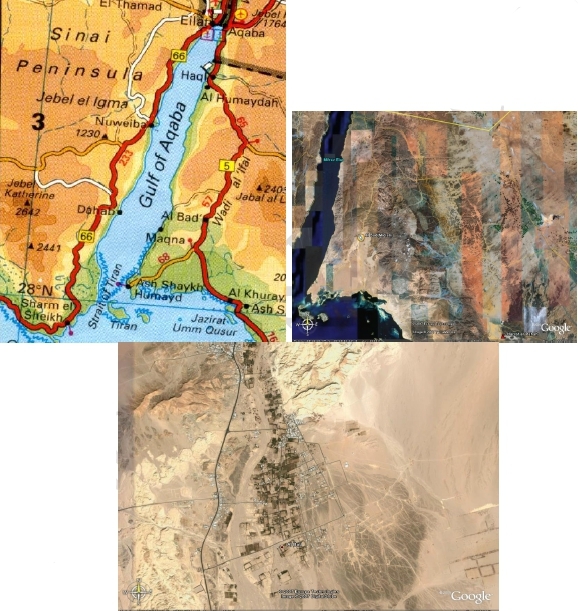 Confusion over the Red Sea crossing stems from a wrong location for Mt.Sinai, which the Hebrews reached after the crossing. 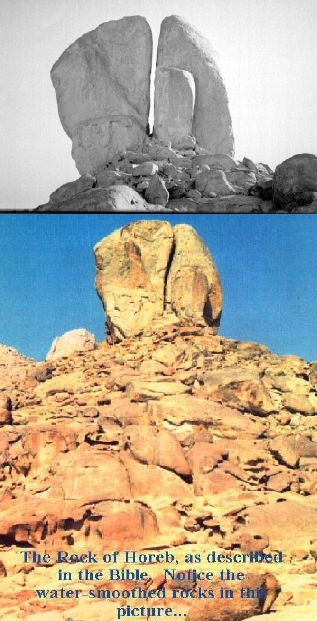 Mt.Sinai as we know it today was land marked by St.Helena in the 4th Century AD. The story has it that she went around the Israeli & Middle Eastern area with a group of men and landmarked places that fit her own ideas. Subsequently, the Church picked these up as traditional historical spots for biblical events. Since the marking of modern Mt.Sinai by Helena and adherence to it by the established Church many Christians had difficulty reconciling the Red Sea crossing. Stories have been concocted that the water was only a marsh, a couple of feet deep – and that this Exodus path went over the area of what over the area of what over the area of what is today the Suez Canal. 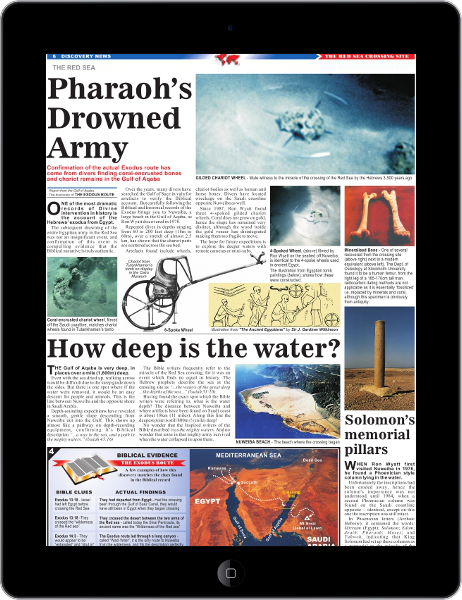 Now it really would have been a “miracle” to drown Pharaoh’s army in only 2 feet of water! 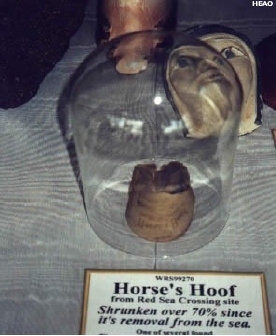 Some people determine to support the Exodus as crossing marshlands from the Hebrew words used in the Bible to name the Red Sea: “yam soof”, which means “Sea of Reeds”. These words are still used by the Jews today, but they are used to name the entire Red Sea including the Gulf of Aqaba and the Gulf of Suez. Regarding a marshland, or lake. Think now. Would it make sense for the Hebrews to flee through a lake, when all they needed to do was to go around it? In any case, marshland crossing does not fit the Biblical account, which describes the crossing spot as “the heart of the sea” Exodus 15:8. The Suez Canal area is NOT “the heart of the sea”. The Suez Canal is NOT the RED SEA. With all of the digging that went on to construct the modern Suez Canal, not to mention the clearing of that canal after the first Egyptian-Israeli war, not one wheel of Pharaoh’s drowned army in that spot was ever found. Firstly, we have shown that the Hebrews under Moses assembled at Succoth, which is OUTSIDE of Egypt. From this point armies or caravan assemblies used to strike SE across the Wilderness of the Red Sea to distant places. At no time was there any reason for them to have to cross the upper reach of the Red Sea (Suez branch), nor did they have any necessity to cross any of the Bitter Lakes. All they had to do was bypass either of these masses of water if they were encountered. This is clear from any map. Look at the map again! At the proposed crossing site south of Suez along the Egyptian shore, if the Hebrews were facing the Gulf of Suez, ready to cross, in which country would they still be standing? The answer is, they would still be on Egyptian soil!! One is still in Egypt, as one faces the proposed Red Sea crossing at the Gulf of Suez. Egypt borders the entire western shore of the Gulf of Suez. 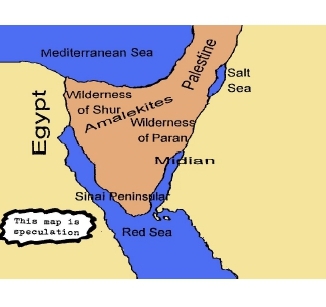 Whatever the Hebrews camped along that coast, they would still be in Egypt. However, the book of Exodus tells us that before they came to the Red Sea crossing, they had ALREADY LEFT Egypt. The “children of Israel went up harnessed OUT OF the land of Egypt.” Exodus 13:18. So, when they later arrived at the Red Sea and found themselves trapped, they complained to Moses their leader, “Because there were no graves in Egypt, hast thou taken us away to die in the wilderness?” They asked why Moses has carried them forth “OUT OF Egypt….we did tell thee IN Egypt, saying, Let us alone” Exodus 14:10-12. You notice, when they found themselves trapped BEFORE crossing the Red Sea, they were already OUT OF EGYPT. Secondly, the proposed crossing spot in the Gulf of Suez is “comparatively shallow.” The Suez area is not deep! When the sea rolled back according to the Bible account, there was not one survivor. I ask you, would 250,000 soldiers (Josephu’s figure) all drown in just 3 to 4 metres of water? Every one of them? And likewise, thousands of strong horses? And how come the multitude of chariots has not been found in such shallow water, to this day? Those who insist on a Lake Timsah or Suez crossing ALWAYS emphasize how shallow the water was. Shallow water couldn’t have swamped Pharaoh and his army! Every single one of these texts is describing the Red Sea crossing spot! The Gulf of Suez is “shallow.” The Gulf of Aqaba is “the great DEEP” – up to 5,400 feet deep – with a ridge crossing it between two deeps! 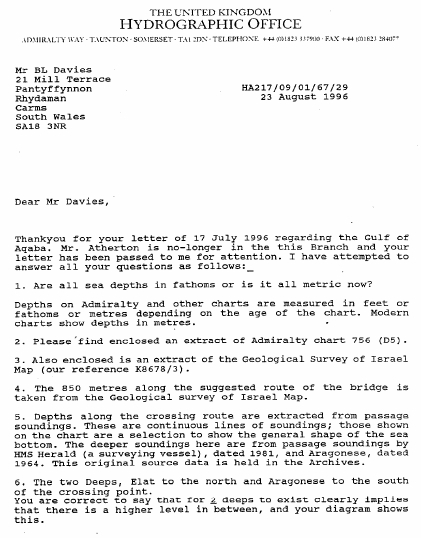 14) Isn’t the Gulf of Aqaba too deep to cross? 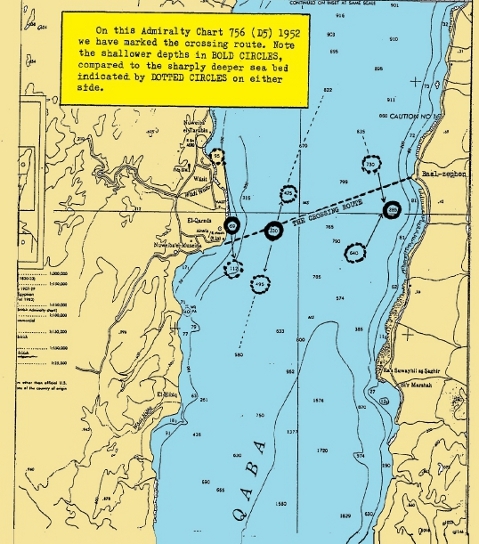 Nautical charts show the Gulf of Aqaba arm of the Red Sea to be an underwater trench more than 5,000 feet (1,600 meters) deep in places. That’s positively “DEEP.” The Western shoreline drops steeply underwater into this “canyon” at a slope of 45 degrees. 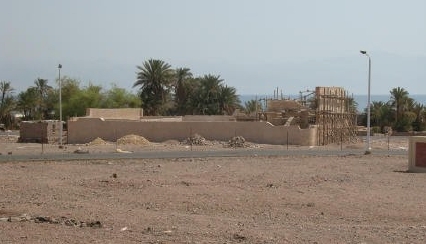 However, at the precise location of Nuweiba beach, the deep trench is spanned by an 8 mile underwater land bridge. 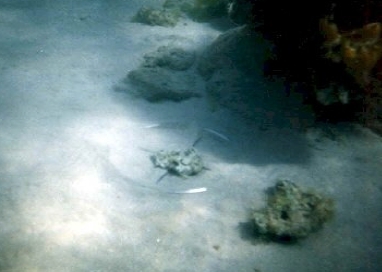 From the Egyptian end, it slopes at a gentle angle of about six degrees underwater – until midway across the sea it is, according to one source, some 300 feet (100 meters) below the surface of the sea. It then gently rises to the opposite shore. This bridge appears to have been formed by washouts meeting each other from two directions – from the Western and the Eastern shores. Perhaps it was during the closing stages of the Great Flood, that the Lord, in His foreknowledge, divided the Gulf with this path across the sea, for the event He saw ahead. • “dividing the water” (Isaiah 63:12) of this deep trench. Based on data from the ETOP05 data base that the greatest depth on this ridge is only 300 to 320 feet deep. If this is correct, there would be no noticeable angle of ascent or descent at all, over the 8 mile length of the bridge. Please note that ETOP05 is claimed to be a combination from various data bases. However, we must say that there remains so much disagreement between the various sources that we cannot be certain about the depth. One thing is certain: the bridge is there! 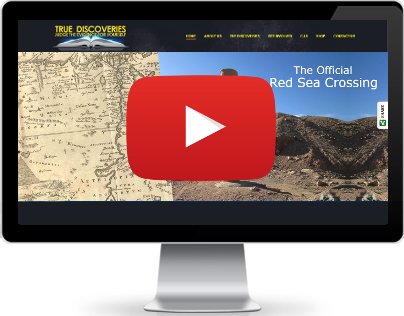 It was by following Biblical clues (disregarding all previous human theories) and accepting every word of the Exodus account as LITERALLY true, that Ron Wyatt & his crew were led to this very spot on the Red Sea. There is NO OTHER LOCATION that fits ALL the Scriptural requirements. On the Eastern shore of the Sinai Peninsula there is ONLY ONE PLACE that is big enough to hold the perhaps 2-3 million people, their flocks and Pharaoh’s army! And the underwater land bridge extends DIRECTLY from that beach area! That beach is so huge that it can be seen from outer space! What if there was no Underwater Ridge Today? For purposes of argument, let’s say that the underwater ridge had over the centuries become eroded away. Would that negate the mass of Bible evidence that indicates that spot? 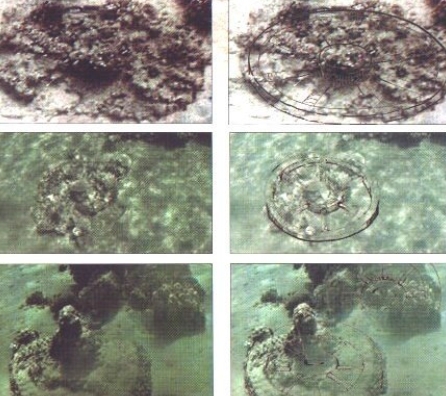 Would it eliminate the chariot parts and skeletal remains found on the seabed? Suppose the Bible said that there was once a lush green plain and a valley (the vale of Siddim) where armies fought in a battle. But today all we can find there is a desert and a salt (the Dead Sea). Would that mean that the Scripture was wrong? We must always remember that Geography can change dramatically. The strongest point to be made is the enormous total weight of evidence – the true Mt.Sinai on the other side of the crossing, with the golden calf altar, Moses 12 pillars, the boundary fence around the mount, the split rock out of which poured the water, and so on. The fact is that NO ONE has been able to find these things anywhere else. The over-all evidence shrieks that this is the spot! As we see the weight of evidence accumulating, to keep opposing it requires an extra measure of foolishness. But trying to pin a man down to FACTS can be futile. His main goal seems to be debating the hair splitting meaning of the word “bridge.” It becomes easier to understand the Lord Jesus Christ’s anger at the Pharisees of His day who thrived on debating the trivial shades of the meaning of the word. It was not that they could not understand Him, but that they would not. Some of God’s people can get so bogged down, caught on a detail of something that to them raises doubt, that they fail to see the weight of evidence, the overall picture, and as a result miss out on the great blessing that God is trying to reveal to them. 15) In the Bible, it says that when the children of Israel crossed the parted Red Sea, there was a strong wind. Wouldn’t the strong wind have blown them all away? Midway across on each side, the cliffs of water were up to 300 feet (100 meters) high, that’s skyscraper height! Only a MEGA HURRICANE could have exposed that deeply covered land bridge and pushed and held two walls of water 100 meters high. The walls of water eventually stood up WITHOUT the wind, and the Hebrews walked through to the other side. Strong’s Concordance notes that “congeal” comes from the Hebrew “qapha” (pronounced kaw-faw), which means “to shrink, ie. Thicken (as unracked wine, curdled milk, clouded sky, frozen water)”. 16) Could Bible writers have wrongly assumed it to be a miracle? There are certain events in the lives of men and nations, for which coincidence is hardly an adequate explanation – events where one senses a greater, even intelligent, reality working behind the scenes. 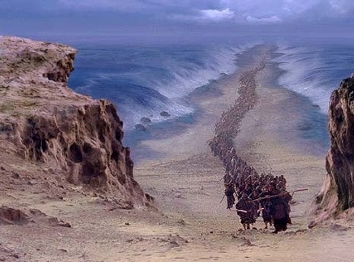 Consider for example, the Red Sea Crossing event. In reading the story, one is forced to the conclusion that either this event did NOT happen as described, or it was a miracle. Well, we can rule out the first option – that it did not occur. We have now been able to document the evidence that it DID. That leaves us with the second option…..a miracle. There are just too many “impossible” coincidences, to call it anything but a miracle. 1. The bridge across the undersea trench – prepared, as it were, ready for the event. From two separate land masses, two washouts occur, which form two half bridges. These meet precisely to form a raised pathway right across the deep undersea canyon. 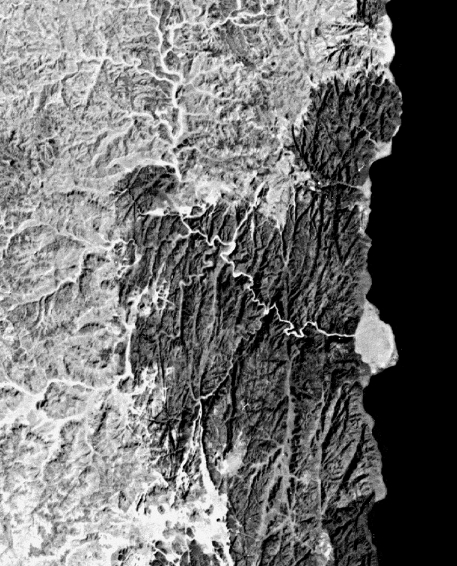 We know of nothing like this – a canyon so bisected – anywhere on this planet. 2. At the right time, a strong wind parted the sea, precisely at the bridge location. 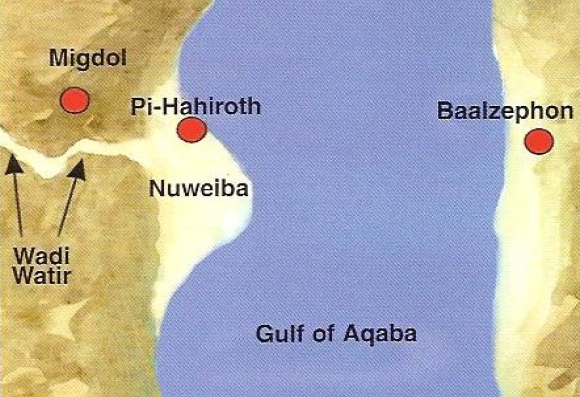 Had the sea split open anywhere else, the fleeing Hebrews would have looked down a 45 degree drop to about 5,000 feet (1,600 meters) – impossible to cross. But at the underwater land bridge it was a gently 6 degree slope, an easy passage for the 8 mile (13km) journey to the opposite shore. 3. On each side of this dry passage through the sea, watery walls of skyscraper height (up to 300 feet/100 meters) were held back. 4. These walls of water stood firm for hours, until every Hebrew was safely on the opposite shore, and then crashed down only when every Egyptian pursuer was on the sea bed. Too many coincidences. A deliverance unique in history – for a once only need. 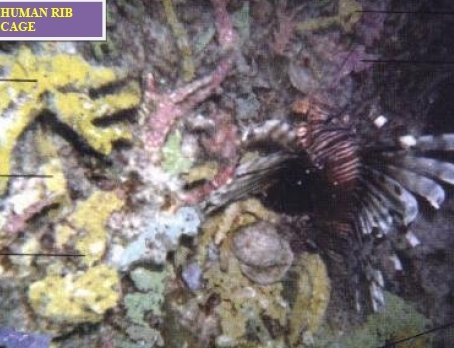 17) What has been found on the sea bed? Ron Wyatt and his team have found the remains of chariot parts, chariot wheels & skeletal parts of horses and men, ALL CEMENTED IN CORAL. Because of this, it is difficult, if not impossible, to extricate them without destroying them. Ron Wyatt did extract the hub of a wheel with parts of 8 spokes attached and presented it to the Egyptian authority. 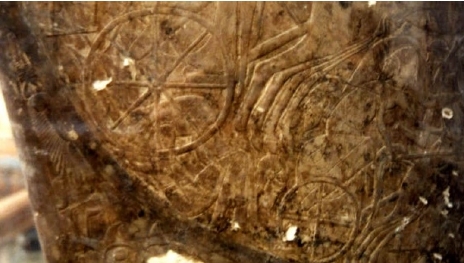 This was sufficient for Mr. Nassif Mohammed Hassan to identify the dynasty from which the wheel came. 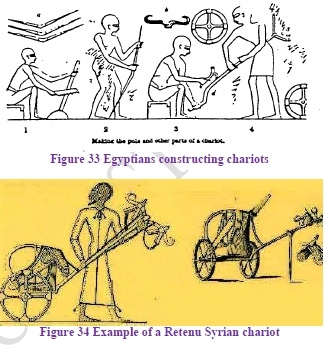 To date, the chariot parts have never been found in the Red Sea anywhere, except this site! 18) Can the remains be protected from treasure seekers? 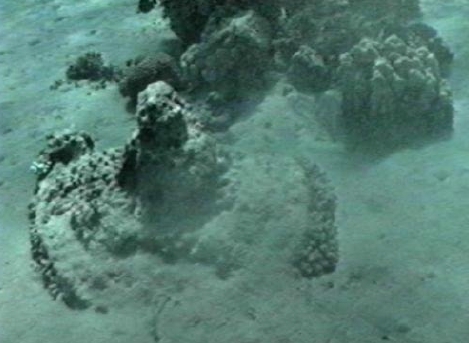 One shudders to think what might be happening to the irreplaceable evidences of the destruction of Pharaohs hosts in the Red Sea, now that Ron Wyatt has revealed the true site. This information would undoubtedly draw hordes of scavengers and treasure seekers well aware of the value that such ancient artifacts would bring. How can these survive? The remains, fortunately, are largely covered with coral, which not only has preserved them, but also helps to disguise their presence. 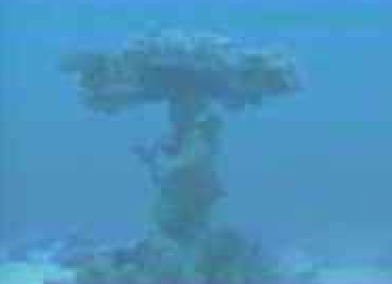 And – fortunately – most of the remains lie at the Saudi Arabian side of the sea, which is out of bounds to tourists, divers, etc. Any divers at the Egyptian side most now report to a local police officer – and no artifacts are allowed out of Egypt. 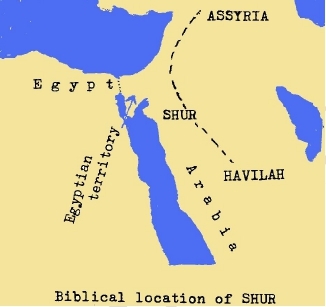 19) If this is the crossing, there should exist the Biblically mentioned sites beyond the crossing – such as Marah, Elim, etc. 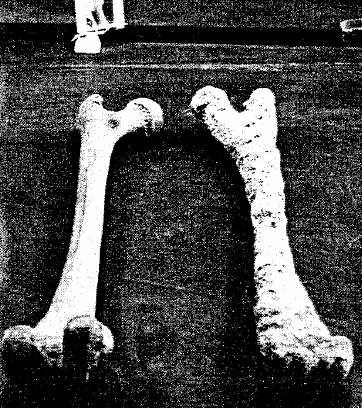 Have these been found? People working on these discoveries in Saudi Arabia and who have gone into this region, time and time again and provided wonderful footage of their explorations, have noticed one major thing. The LACK OF PALM TREES! Especially considering how plentiful they are in Egypt. There were no palm trees anywhere throughout the large, dry valleys which led from the seashore directly east. “And they removed from Marah, and came unto Elim: and in Elim were twelve fountains of water, and threescore and ten palm trees; and they pitched there” Numbers 33:9. The two wide north-south wadis mentioned above end to the south at an east-west wadi, which again leads back to the sea. And there these three wadis intersect, there is an extremely large oasis with hundreds of palm trees, and 12 wells of water. We have no doubt that this is the Biblical Elim. The 70 palm trees have proliferated and now hundreds of their descendants are thriving in this extremely desolate and arid region. “And they removed from Elim, and encamped by the Red Sea” Numbers 33:10. Why did the children of Israel go back to the Red Sea? Did they reverse back to the crossing spot? Why would they do that? But since the exploration of this area, we now know why! This third wadi (the east-west one) leads just a few miles westward to the sea! From the sea there branches off another wadi, and then they resumed their travel, they would have followed this. Along this route they made two more encampments – Dophkah and Alush. We may never know their exact location, since no information is given. After a short distance eastward, they met the Wadi Alfa, which cuts north-south. They veered left and after travelling the Wadi Alfa between mountains into an open plain, they immediately turned east into the foothills of the western side of Jebel el Lawz. Here they found themselves at Rephidim. And now the people became very angry at Moses because of the lack of water. It was here that the Lord caused water to gush out of the “rock at Horeb”. Evidence which survives here of this awesome event is given in the “Mt.Sinai FAQs” section. Down through history, the inhabitants of Al-bad, a short distance to the south of here, have preserved the memory of Jethro (Moses father-in-law) who came to visit Moses after the Israelites arrived at the “mountain of God”. They still claim this day that the oasis of Al-Bad was his home. Travellers through the region in the 1800’s all recorded the tales told them about Jethro. 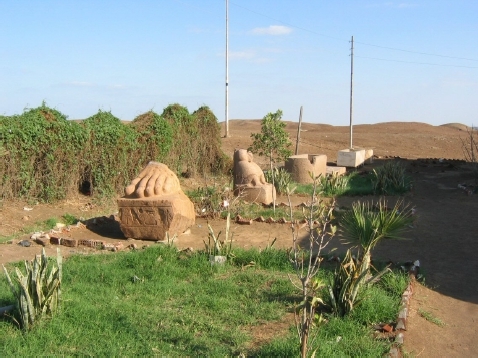 The stone circles around Al-Bad are called the “circles of Jethro”. Al-Bad is the only large oasis in the N.W. 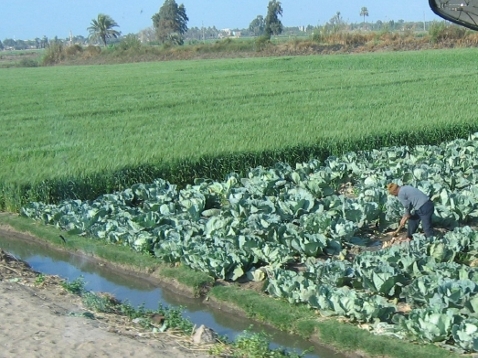 Arabian plain near Jebel El Lawz. We firmly believe this was his home and the home of Moses during his exile.